Me: My racquet might be too heavy. Should I bother trying out some different tennis racquets? 8-ball: My sources say no. Me: Oh, ok. So I should stick with my current racquet? Me: Huh. What about the strings? Should I just stick with the Signum Pro? Me: Yeah, strings are tough. Sometimes I feel like they are perfect, other times not. Would a thinner gauge string be better? 8-ball: Don’t count on it. Me: I know, I know! It’s not the equipment, it’s the player. 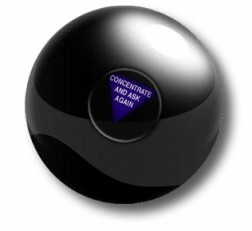 Will I have a good practice tonight? Me: Sweet. I always like a good practice. How about cheese? Should I smear cheese all over my grip to hold onto it better? Me: I was with you about the string thing but now I’m not so sure. Do you know what you’re talking about tennis-wise? Me: Ok, if you say so. Same racquet, maybe the same strings, but spread cheese all over the grip. Got it. Will I make it to the finals of the Silver Lake singles tournament by doing this? 8-ball: As I see it, Yes. Me: Hmm…I’m really not much of a singles player, are you certain? 8-ball: It is decidly so. Me: Wow, confident. Will I win that final? Me: Bummer. Though the finals would be cool. Should I wear a skirt to the match? Me: That’s what I thought you’d say. Should I also play the match barefoot? Me: Yeah, then I’d look silly. Anyway, my backhand remains a problem. Should I switch to a one-hander? Me: Alright…I suppose it merits careful consideration. Hmm…what else should we talk about? How about the French Open? Can you predict the winner? Me: Cool. It’s going to be Nadal isn’t it? Me: But you just said you could…will Roger Federer finally win the French? 8-ball: Concentrate and ask again. Me: (Concentrating) Ok, will Roger Federer win the 2009 French Open? Me: I knew it! It’s Nadal isn’t it?! Me: Well then it should be an interesting open indeed! Not Federer or Nadal! Well, it was great talking with you. Did you have a good time too? I’m betting Nadal wins it without dropping a set. So there you have it. According to the wisdom of the 8-ball, neither Federer nor Nadal will be winning the French Open.